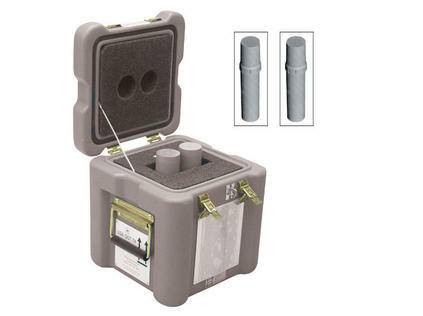 This Compact PET Shipping System transports two 3 cc or 5 cc doses containing high-energy radionuclides such as FDG F-18. Dose syringes fit into the pigs with or without an attached needle. Designed to conserve space and minimize weight, the shipping container weighs only 55 lb. An important feature is that the shipping container can be left at a convenient height while the pig (9 lb) can be easily removed from the container. The pig is then placed behind an L-Block Shield for dose loading and unloading. All Biodex PET L-Block Shields incorporate a hex-shaped plate that corresponds with the hex shape at the base of the pig. 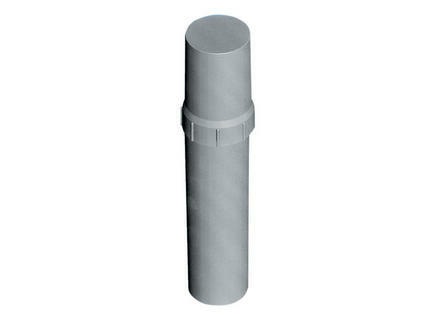 This design element allows one-handed loading and unloading of syringes. The system meets DOT Yellow II Type A packaging requirements when shipping up to 160 mCi (5.92 GBq) in one pig and 235 mCi (8.70 GBq) in the other, totaling 395 mCi (14.62 GBq) of FDG F-18.